I am a simple guy trying to make sense out of this crazy world. This Photoblog is a collection of frames that I freeze while moving along with my camera. I update this blog everyday so keep visiting regularly to what new I am capturing in my camera. You can subscribe the RSS feed and get the latest updates in a RSS Reader or in your email inbox. This entire blog ⓒ 2008-2009 Tarun Chandel. All of the photographs herein, unless otherwise noted, are copyrighted by the photographer. No part of this blog, or any of the content contained herein, may be used or reproduced in any manner whatsoever without express permission of the copyright holder(s). 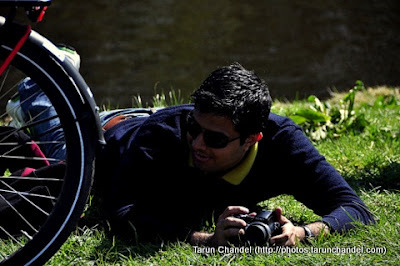 If you wish to use pictures from this blog please drop me a mail (tarunchandel AT gmail). I am Aditya from Bloggers' Mind. We are a social media consultancy. We work for various clients, Nokia India being one of them. We are doing a special activity on Nokia's newly launched hi end phone N8-00 which has a 12 megapixel camera with Xenon flash and Carl Zeiss optics. We would like to send you an N8-00 for a trial and we would like you to explore the phone and share your inputs and feedback. For the same, we would like to have your mailing address and your contact info so that we can be in touch. I would like to inquire about getting usage permission for some of your photos. Specifically one you took of the Howrah Bridge. geat pics of Sagar Vihar, Vashi. Im a Vashi-ite but recently moved to London, and I saw your Edinburgh snaps and loved them too, so thought Id drop in a quick note of appreciation. If you're Ok, we'd love to hear from you either here or on our FB wall!